For organizations operating within regulated industries, a secure email storage solution can resolve a number of potential issues relating to retention, storage, and retrieval. Using a cloud-based solution for securely storing emails also mitigates the risk of data theft and a loss of data in a disaster. Implementing a secure email storage solution can also have benefits for organizations who do not have to comply with industry regulations, as a solution for securely storing emails can reduce the workload of mail servers and eliminate the need for email inbox quotas. In addition to the compliance requirements of certain regulated industries and the benefit of easing the workload of an email server, there are two compelling reasons to consider a secure email storage solution – productivity loss and insider theft. The loss of productivity due to being unable to find an email, trying to navigate a cluttered inbox, or trying to recover an accidently deleted email can be considerable. A solution for securely storing emails eliminates these problems and reduces the workload on IT support. Insider theft is potentially a bigger concern. Confidential data that can be used for identity fraud, “outsider trading” or extortion has a high value on the black market, and organizations who implement a secure email storage solution are less likely to fall victim to this type of crime. A cloud-based secure email storage solution works by copying all sent and received emails and archiving them in encrypted format in a secure data center. This solution for securely storing email is preferable to disk or tape storage, as it eliminates the possibility a removable medium is stolen, lost or damaged. The archived emails are deduplicated, compressed and indexed so that authorized personnel can quickly search, view and retrieve emails from any web browser or from within compatible email clients such as Outlook. A tamper-evident system ensures that any edits are recorded and logged. Once accessed, emails for retrieval can be printed, exported or restored to the mail server without interrupting the flow of email. Selected emails can be deleted in bulk subject to retention policy parameters, and searches can also be saved or automated, with the results delivered to an email inbox. In industries such as the healthcare industry, where the encryption of data is an “addressable” requirement of the Healthcare Insurance Portability and Accountability Act, the integrity of the data has to be ensured “at rest and in transit” to prevent their improper alteration or deletion. In other industries, encryption during email transfers is also important to prevent “Man-in-the -Middle” interceptions – or at least to make any intercepted data unusable. Copies of unencrypted emails can remain indefinitely on ISP servers, providing plenty of opportunity for a cybercriminal to steal data. When evaluating any solution for securely storing emails, key elements to look for include that the vendor transfers emails via mandatory TLS, that passwords are hashed as well as encrypted, and that the data centers to which the emails are transferred are certified to IL4 standard or higher. 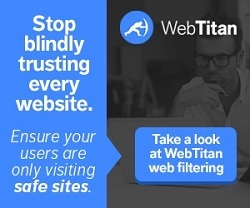 WebTitan´s solution for securely storing emails is ArcTitan – an easy-to-use and fully compliant cloud-based secure email storage solution that resolves retention, storage, and retrieval issues, mitigates the risk of data theft, and reduces the workload of mail servers. ArcTitan is fast. It can process 200 emails per second from an email server and archive them instantly. It takes less than a second to search 30 million emails and deliver results. Our secure email storage solution scales to over 60,000 users and is compatible with all leading email servers and email services. Most of all, ArcTitan is secure. All data is transferred to our IL5 data center via mandatory TLS with passwords hashed. Our transfer and storage service complies with all major international regulatory requirement and industry standards, and our solution for securely storing emails includes full email audit functionality for e-discovery, retention and audit compliance. If you have concerns about your organization´s compliance with regulatory standards for the integrity of emails – or you simply want to ensure your email correspondence is archived securely – speak with us about a thirty-day free trial of ArcTitan. We will guide you through the process of setting up a free account and provide step-by-step instructions for configuring your mail server to duplicate your emails, or have our support team work with your IT department to manage deployment for you. During the free trial period, you will be able to set permission tiers, tag group emails into sets to retrieve on demand, and define your own retention policies to prevent the accidental deletion of business-critical information. Once the trial has ended, if you are happy with our solution for securely storing emails, you can upgrade to a full account with no configuration changes required. Contact us today with any questions you have about our secure email storage solution and for more details about our free trial offer of ArcTitan.